The paper discloses advantages of usage of films made of high-temperature superconductors for creating various microwave devices. The quality factor of an asymmetric strip resonator of film design is estimated at frequency 2 GHz and at 77 K (liquid nitrogen temperature). Frequency responses of a nine-resonator band-pass filter designed with the use of films are included. 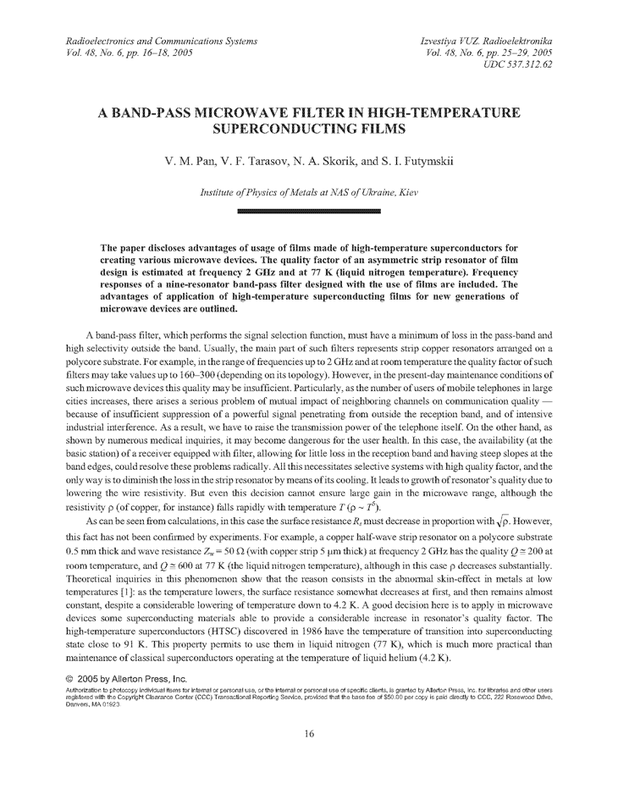 The advantages of application of high-temperature superconducting films for new generations of microwave devices are outlined. MENDE, F.F. ; SPITSYN, A.I. Surface Impedance of Superconductors [in Russian]. Kiev: Naukova Dumka, 1985. VENDIK, O.G. ; POPOV, A.Y. ZhTF, v.63, n.7, p.1-9, 1993. LOSEV, A.K. Theory of Nonlinear Electric Circuits [in Russian]. Moscow: Vysshaya Shkola, 1987. FEL’DSHTEIN, A.L. (ed.). Handbook of Elements of Strip Devices [in Russian]. Moscow: Svyaz’, 1979. TARASOV, V.F. ; KOROTASH, I.V. ; TABOROV, V.F. ; TRETIACHENKO, C.G. ; VYSOTSKII, V.V. ; PAN, V.M. ; IVANYUTA, A.N. ; MELKOV, G.A. ; LORENZ, M. Band-Pass Filters for 1.8 GHz Frequency Range Using Double-Sided YBCO/Au Films on CeO2-Buffered Sapphire. J. Superconductivity, v.14, n.1, p.115-125, 2001. DOI: http://doi.org/10.1023/A:1007896609014. JACOB, M.V. ; Mazierska, J.; TAKEUCHI, S. Miniaturized superconducting filter for mobile communications. TENCON, 14-17 Oct. 2003, Bangalore, India. IEEE, 2003, p.631-634. DOI: https://doi.org/10.1109/TENCON.2003.1273247. NEWMAN, NATAN; LYONS, W. GREGORY. High-temperature superconducting microwave devices: Fundamental issues in materials, physics, and engineering. J. Superconductivity, v.6, n.3, p.119-160, 1993. DOI: http://doi.org/10.1007/BF00625741.